Durango 100 percent renewable by 2050? 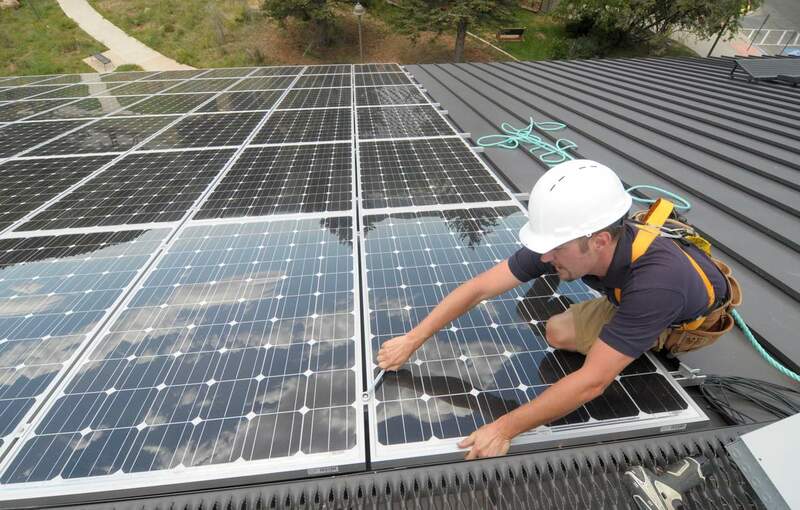 A petition backed by an unofficial coalition calls for the city of Durango to transition to 100 percent locally produced and renewable power by 2050. A petition calling for the city to commit to transitioning to 100 percent locally produced and renewable electricity by 2050 has garnered hundreds of signatures. In addition to cutting carbon emissions, the petition states, the transition would create local jobs and stabilize energy rates as the cost of fossil fuels continue to rise. Three hundred people have signed the petition, said organizer Lissa Ray of the local chapter of the Sierra Club. The Sierra Club’s Ready for 100 Campaign, which challenges cities to set a goal to transition to 100 percent clean power, inspired Ray and her husband. “We thought Durango needed to be part of that movement,” she said. The goal is to meet all the needs of people living and working in the city with renewable power, she said. Since she started collecting signatures, an unofficial coalition called Durango Energy Future has formed. It includes representatives from Indivisible Durango, the San Juan Citizens Alliance, Sierra Club, Sustainability Alliance of Southwest Colorado, Local First and other groups. Ray said a lack of leadership at the national and state levels about climate change means individuals have to take action at the local level. But there are also compelling economic reasons to pursue locally produced renewable energy. Millions of dollars leave the community to pay for electricity; locally produced energy could keep that money in the community, she said. Major companies are making the shift to renewable energy because it is economically sensible and because they are feeling pressure from consumers, she said. She used Xcel Energy’s recent announcement as an example. Xcel announced this week that it plans to produce 55 percent clean energy by 2025 as part of its Colorado Energy Plan. It also plans to close two older units at the Comanche Generating Station in Pueblo – one in 2022 and one in 2025. A third, newer unit would keep operating. Taking the two coal-fired units offline is expected to reduce carbon-dioxide pollution by 4 million to 4.5 million tons a year, said David Eves, president of Colorado operations for the Minneapolis-based utility. The local coalition plans to present its petition to Durango City Council in the next few months and to ask the councilors to sign a resolution that outlines the goals stated in the document. “I think more than anything else, it’s a statement of commitment,” Ray said. If the council adopts the goals, she hopes city staff would work with the coalition to develop an implementation plan. But she also expects businesses to take an active role in reaching the goals. For example, business owners could collectively invest in a solar farm that would produce energy that they would use, she said. There are 40 businesses that have signed on to support the petition so far, said Monique DiGiorgio, executive director of Local First. La Plata Electric Association does not have a position on renewable goals stated in the petition, said Ron Meier, manager of engineering and member relations. “If the city and the citizens want that, we will work toward that to meet that goal,” he said of the 100 percent renewable-energy proposal. Reaching the goal by 2050 is also reasonable, he said. The council already has made sustainability a priority, and the city has identified several renewable-energy projects that could reduce its reliance on traditional power sources, he said. The city plans to expand its ability to generate power by capturing methane gas as part of the Santa Rita Water Reclamation construction project, LeBlanc said. The city could also add solar arrays at the water treatment plant and near Greenmount Cemetery and put in hydro-electric generation in city water pipes. The solar arrays and hydro-electric generation projects are not part of the city’s five-year construction plan right now, he said, but the city is reprioritizing all water and wastewater construction projects this year. The renewable energy projects would likely require a third party to build and install any of these devices. LeBlanc said the city would agree through a contract to buy the power from the third party for a certain period, and at the end of the agreed period the city would buy back the facility. A third party is necessary because it could take advantage of the tax credits that make renewable-energy projects financially viable, he said. Ray believes there are plenty of local experts who can assist with an implementation plan to achieve 100 percent local renewable energy. “I think we can rely on their expertise,”she said.